HappyMommy HappyRachael: 40 and Fabulous! I case you forgot, yesterday was my birthday. I know, I hardly mentioned it. Sure kept it to myself these past few weeks! I really had a great day. Jeff let me sleep. The crew made me breakfast, then church, a little shopping and dinner with the family. I got some great gifts. One made me jump up and down like I was five and just got tickets to Disneyland! My dad got a picture and if it surfaces anywhere, I will pout. 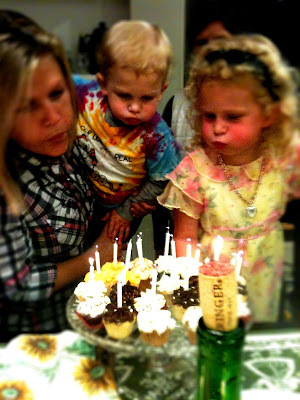 It was a perfect birthday full of family and cupcakes! Happy Belated Birthday, the 40's are fabulous, you finally feel grown up & still feel young enough to do something about it.